Participants were measured each week to determine level of hair reduction. The following significant differences could be observed between Hairfree™ treated areas and placebo treated areas of skin. 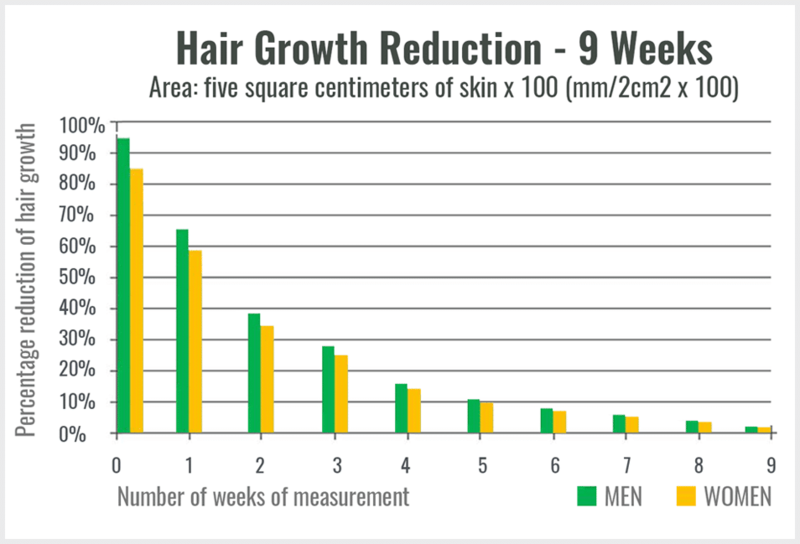 An overall decrease in hair density on areas treated with Hairfree™ of +/- 25% every week was measured using a Cross-Section Trichometer over one square centimeter of skin x 100 (mm2/cm2 x 100). Participants also noted a reduction in hair thickness during the trial. At the conclusion of the study an overall decrease in hair density on Hairfree™ treated areas was +/- 93% measured using a Cross-Section Trichometer. Hairfree™ has been shown to be a safe and effective method for progressively stopping hair root growth. Jankovic SM, Jankovic SV. The control of hair growth. Dermatology Online Journal. 4(1):2, 1998. Stenn KS, Paus R. Controls of Hair Follicle Cycling. Physiol Rev. 81(1):449-494, 2001. Milner Y, Sudnik J, Filippi M, et al. Exogen, Shedding Phase of the Hair Growth Cycle. J Invest Dermatol. 119:639-644, 2002. Craven AJ, Nixon AJ, Ashby MG et al. Prolactin delays hair regrowth in mice. J Endocrinol. 191(2):415-425, 2006. Carbajo JM. Cosmética Capilar. Dermofarmacia. Consejo General de Colegios oficiales de Farmacéuticos, Módulo II. Madrid, 1989. Mandt N, Troilius A, Drosner M. Epilation Today: Physiology of the Hair Follicle and Clinical Photo-Epilation. J Investig Dermatol Symp Proc. 10(3):271-274, 2005. Results vary depending on hair thickness and density. Coarse black hair will take longer to treat than thin blond hair.